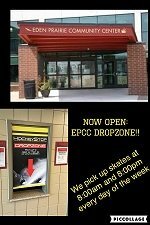 Now Open: Eden Prairie Community Center DropZone!! 3) Skates will be ready the next day, we'll text you when they are ready for pick-up. Always pick up your finished skates at the store in Chanhassen.